The coffee ritual is strong in my family. My father has it, I have it, and my sister has it. And, like every other family, we have our own rituals and brewing methods. The above percolator is an emergency replacement on a camping trip. Gross coffee is better than no coffee... almost. Even when we're in a trailer, especially then, I need to have a little time to drink my cup in the early morning without being rushed. 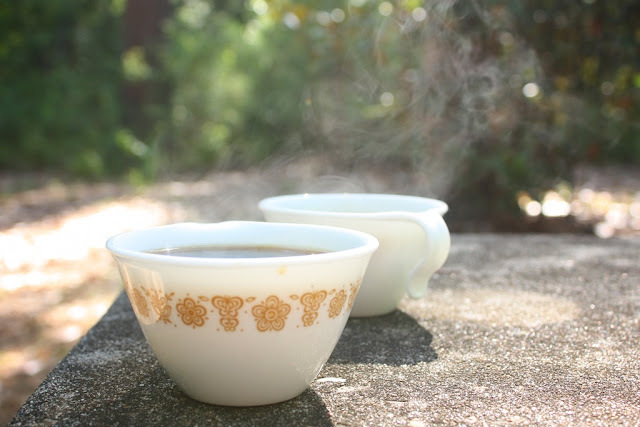 I love it when it's cool outside and the coffee is super steamy. Once I'm done, it's okay for us to hurry off on some trek, but trust me, not a moment before. Coffee should not be rushed. Most mornings my husband and I press Community coffee (they're the ones with a chicory blend) and try for a leisurely breakfast. But it usually ends with everyone scattering away from the table packing and combing things like mad, everyone but me. I forego a sharp appearance (I'm just going to run like a native anyway) to stare into space a bit longer. Unless it's Saturday morning, then we all take our time and stare into space with SpongeBob. After a run, I may have coffee with my dad and some of his buddies that walk up, off and on, throughout the morning. We may all sit around him on upturned milk crates, drinking coffee while he works on a lawn mower, but usually he uses company as an excuse to go inside for a cup and break from his work. He's always got freshly brewed Folgers and has mastered his coffee system. He's been using the same kind of drip pot and thermos my whole life. I used to wake up very early in the morning as a little girl to have cawk-ee (how Precious Moments of me) with him, basically just milk with a hint of coffee, then I'd want to go right back to sleep. Some things never change. Oh, and don't ever try to wash his pot with soap. He probably passed the ritual on to his children because, though they entertained with it and he had many a meeting about labor disputes over it through the seventies and eighties, my mom never drank it. Even if I'm home alone and drinking it iced, I fall into my family ritual of using coffee as an excuse to slow down and relax. It doesn't have to be social, I'm cool with drinking it while I knit in silence or sit on the patio. Anywhere is good, as long as you don't rush me. Love your coffee post and photos. I have never been a fan of coffee, but my husband is. After 20 years I finally started drinking a cup on Saturday mornings with him. He brings it to me with exactly two spoons of sugar and creamer. I do think I enjoy that ritual more than the drink itself. I now have a cup or two every morning before I start my day at work. I still don't like the taste, but it does give me a little pep in my step, starting my day off right!